There is an old saying that you only get one great dog in your life time. Matlock was my exceptional dog and best friend. 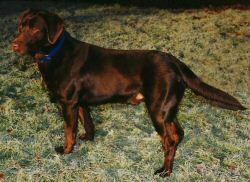 Matlock was handsome with a long thick deep dark chocolate coat, broad head, otter tail, dark pigment, and stocky show dog looks. He was hard charging, agile, well mannered, affectionate, and had an explosive water entry. Matlock received an Open Reserve JAM (Judges Award of Merit) in the Spring of 2001. Matlock received an Amateur 2nd and an Amateur JAM (Judges Award of Merit) in the spring of 2000. Matlock received an Open 2nd, two Open 3rds, and a JAM in 1999. Matlock needed a win for his FC title (Field Champion). Matlock JAMed an Open at age 33 months in 1997. Matlock won the first two Qualifying field trials he was entered in at the age of 27 months. Matlock received six Derby points and eleven JAMs in 1996. Matlock was retired from competition in the spring of 2002. Matlock underwent spinal surgery late spring 2001 to excise a foxtail (barbed grass) that had migrated from his lungs. Matlock did not have the endurance post lumbar spine surgery to run competitively at the All-Age level in field trials. Other than this two year protracted illness, Matlock's health history was excellent until his last year.